With the Thrashers going to Winnipeg, the Manitoba Moose are probably moving out of the 'Peg. No one knows where yet, but rumors indicate former AHL city St. John's is in the running. Additionally, the Wolves are likely out as the AHL affiliate for the "Thrashers", since the Moose are owned by True North Sports. Meanwhile, Rochester is going with Buffalo. Syracuse is upset with Anaheim and getting interest from Tampa Bay. Portland and Florida are both out in the cold right now as well. Confused? It's OK, because so is everyone else. Season Recap: Who Was The Most Improved Player? In recapping the season, today we seek to answer the question: Who was the Texas Stars' most improved player this season? For this one, I chose players who spent most of this and last season with Texas. I'll present the case for a few different folks and let you guys fight it out in the comments, on the Twitters and on Facebook. Gazdic's rookie year was unfortunately marred by injury at times with shoulder issues causing him to only play 49 games of 80 and miss the playoffs after surgery. Luke played 72 games in the 2010-11 campaign and five of the six total playoff games. He improved his scoring from 3-1-4 to 9-8-17. Gazdic also scored his first home goal of his professional career this year. Surprisingly, all of last year's goals were scored on the road, robbing fans of the ability to cheer "Luuuuuuuuuke!" as the goal horn sounded. Meanwhile, he lowered his penalty minutes from 155 to 110 this season. If you were to compare Gazdic's game between this season and last, you would see a jump in confidence and skating ability. It seems like there is still some question of where to place him. Does he go in front of the net or should he be sharpshooting? Additionally, Luke is still working on the defensive side of his game with a minus-3 this year despite 17 points. Gazdic also picked his spots more this year in terms of dropping the gloves. As hockey fans will tell you, there is a strategy to fighting. Much to the chagrin of some of the more casual fans, Gazdic didn't always drop the gloves, but there was always the threat and that was enough to keep the other teams in check many nights. That physical presence was enough to open up some room for other players on his line at times. When paired up with Cody Chupp and Sean Backman, the trio tore a hole through teams that didn't expect scoring prowess from a fourth line matchup. Chupp and Gazdic banged bodies in the corners while Backman and the defense took advantage of the wide open space to score goal after goal. The line was eventually broken up, but it showed a glimmer of possibility. Can Gazdic continue to grow to become the sort of player who opens the ice for skill guys? Would a line with Gazdic, Rallo and Morin be on the table? It depends on Gazdic's ability to keep up the pace as well. He took large steps in his skating and passing ability but still needs more. Continuing to work on his defensive game will make him even more indispensable. 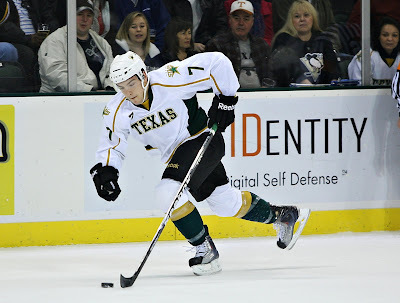 After the unsuccessful campaign for the Calder Cup in 2010, Colton Sceviour was one of many Texas Stars at the Stars' development camp in early July. I managed to catch up with him there and ask him what he wanted to do in his sophomore year. Sceviour wanted to be the kind of player who was trusted to be on the ice in every situation, whether even, up a man, or down a man. That is exactly what Sceviour was to Coach Gulutzan this year. 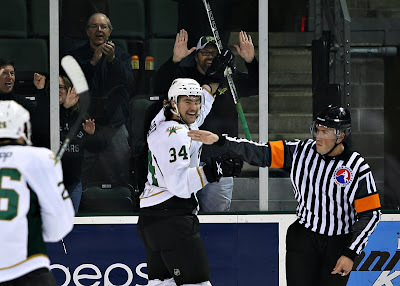 The second year pro was out on the penalty kill and the power play regularly for the Stars. He upped his offensive numbers by 10 points from 9-22-31 to 16-25-41 and appears to have more to give. Colton centered a crash-and-bang energy line for Texas with Tousignant and Sawada for much of the year. His plus-minus dropped, but this is because he was called upon to take more defensive zone faceoffs and placed in more critical situations. He was still positive at plus-4, so it's a good sign regardless. The optics were just good on the young forward, who is officially listed as a right winger but played center for Texas most of the year. He appeared more confident and really had his game going toward the end of the year, earning a callup to Dallas to play against the Flyers amid an 11 point March campaign. What's next for Colton? Dallas has told him that they don't expect him to be a top-six guy for them when he comes up. He will continue to work on that defensive game for sure with more penalty kill responsibilities and tough D-zone faceoffs. The importance of a gritty 3rd liner who can kill penalties is pretty large as shown through current Dallas Stars such as Steve Ott and Adam Burish. The Houston Aeros and Binghamton Senators are both each one game away from representing their respective conferences in the Calder Cup Finals. The two teams could seal up sweeps in the conference finals and move on to the Calder Cup round as early as tonight when both teams play Game 4 of their series. Follow our friends The Third Intermission (@3rdIntermission) on Twitter for more updates. With all that said, who's up for a roadtrip to Houston next week? 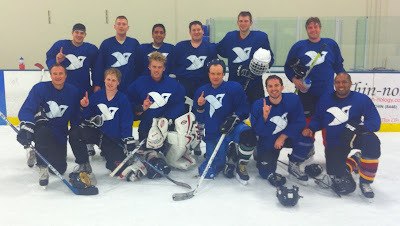 My mixed league team after winning the Winter 2010 Mixed League Championship. I scored the game-winning shootout goal. I don't usually like to repost, but this was an important one from back in the day. This summer marks my two year anniversary of learning to skate and starting to play hockey. Promoting not only the watching but also the playing of the game of hockey in Austin is incredibly important to me. So with that said, I give you my post on learning to play hockey in Austin. For the record, I am much better at backwards skating now and I don't fall down much anymore either. I've played three seasons now in the draft league as well. I'm incredibly proud to say that I am a hockey player. I didn't get started when I was 3 like most professional players. I couldn't even skate before I got started last June. I took the Learn to Skate classes at the Chaparral Ice Center here in Austin for a few months and then jumped into the learn to play classes on Sunday nights at the Northcross Mall location. I have loved all of my time spent there. Hockey is an amazing game to watch and an even more amazing game to play. I've started in a mixed league, and I'm looking forward to joining the summer C league. I play drop-in hockey any time I can and go to stick and pucks as much as my schedule (and wife) will allow. My point in this post is not to regale you with my story of hockey. It is to inspire you. Hey you! Yea, you. I've seen you at the rink. You go to the drop-in games and just watch from behind the boards. You've even shown up to watch the learn to play class a few times. Maybe I've seen you at the public skating sessions. We might have talked even on the ice while we skated. You asked me about how I got into hockey, and I tell you about how easy it was to learn thanks to the resources here in Austin. I tell you about how nice every single person I've ever worked with has been. And still, I don't see you on the ice at learn to play. You aren't there at drop-in. You haven't joined the league. It's not the 'right time'. You aren't sure if you're ready. I've watched too many hockey friends sit on the sidelines waiting to start playing, hovering at drop-ins and hanging out in the pro shop, waiting to enjoy the greatest game on this earth for themselves. Don't be intimidated. I'll tell you a secret. I still can't skate backwards very well. I fall down a lot, too. But no one cares. We are all on the ice to play this great game. And you should be out there, too. Please, if you want to learn to play hockey, do it. Step up right now and say, "I'm coming to the Saturday morning learn to skate class this weekend" or "I'll be at the Sunday afternoon learn to play class". Step up and be a part of the best game on the planet, because you're ready. 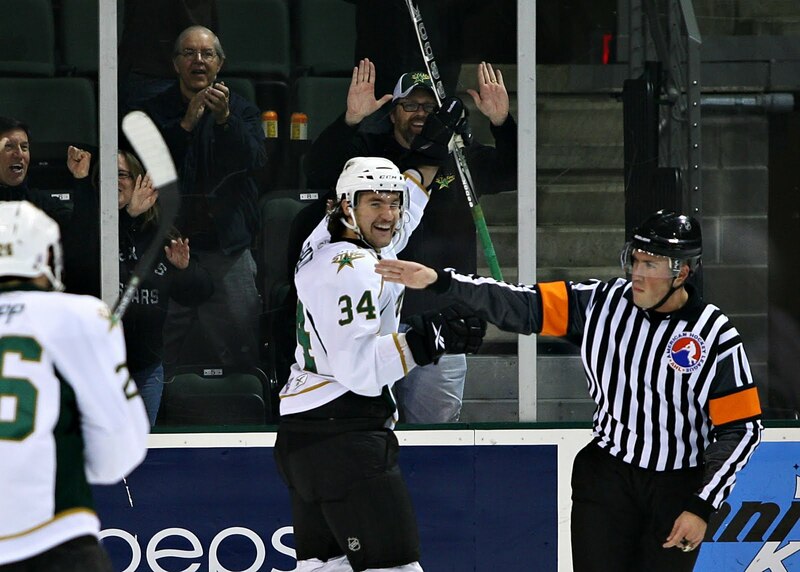 Texas Stars defenseman Dan Spang will head back to Europe next season according to reports from EuroSport.com today. Spang, who played with Nuermberg Thomas Sabo Ice Tigers in the 09-10 season, will join the Elitseiren's Vaxjo Lakers next year along with former OKC Baron Brad Moran. Apparently, Spang was on the radar for the team in January. They tried to snipe him away but there were some visa issues. Here is a roughly translated quote from Lakers GM Henry Evertsson: "We chased him back in January when we were looking slopes before the transfer window closed. But first, there were problems with his double pass, and the price tag was too expensive." 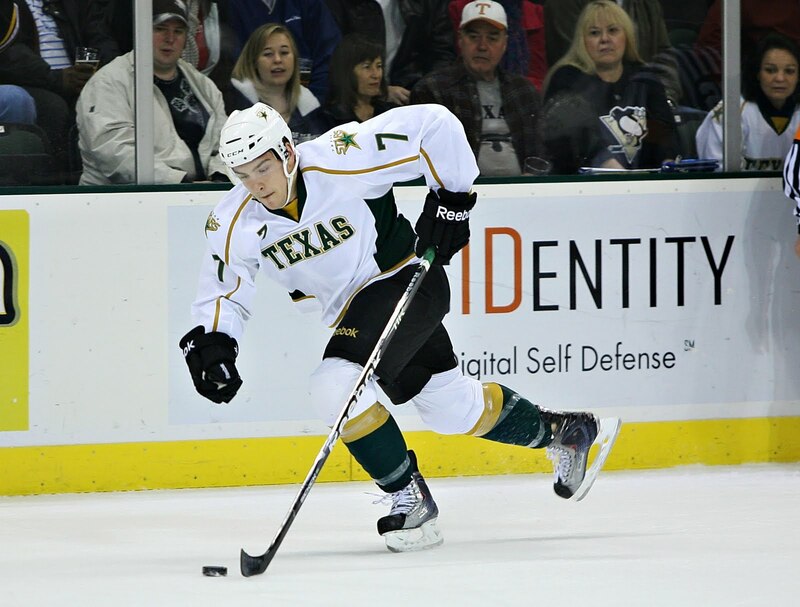 Spang finished the season in Texas with 10 goals and 27 assists in 77 games played and added four assists in six playoff games. Spang was going to be another member of an already crowded blue line and might have seen the writing on the wall with regard to his prospects in Austin with all the Dallas D prospects coming in. "A little inconsistent, he can be described as both a great talent and a late bloomer. Spang was drafted as a young man already in the second round of the San Jose Sharks, but was immediately after it is perhaps not quite the developments all hoped for. However, he has the past few seasons done very well, he comes to us after having responded to a real gun away season in the AHL."